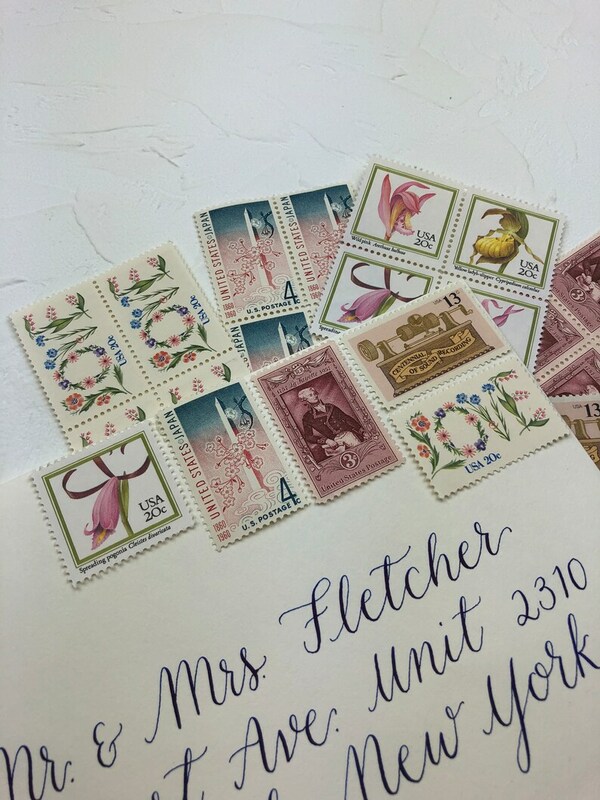 Our assortment of "Floral Pink" vintage postage is perfect to mail an invitation, announcement or special mailing. Thanks for shopping and please email me directly at info [!at] littlepostagehouse.com with any questions! 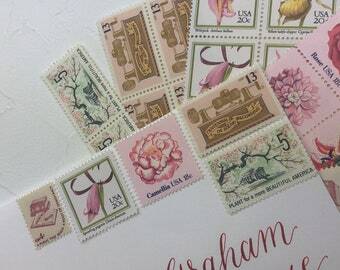 To learn more about our vintage postage stamps, the assortments and postage tips, please visit littlepostagehouse.com. Below please find general information. 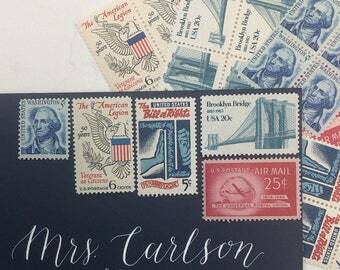 CUSTOM ORDERS / LARGE QUANTITIES: If you're interested in placing a large order of vintage stamps, please email us and we'll setup a custom listing just for you! Additionally, I would love to create a stamp assortment just for you! 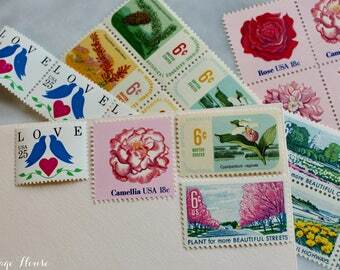 I have thousands of vintage stamps and can work with you to create your vision for your mailing. ENVELOPE / LINER COMBINATIONS: We have an assortment of beautiful handmade lined envelopes that will elevate the beauty of your mailing. 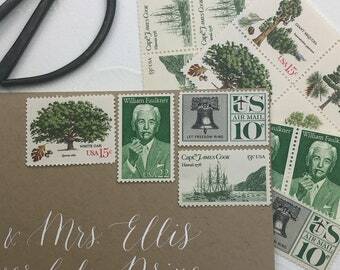 To add a liner envelope combination to your vintage stamps order, just request a custom order. 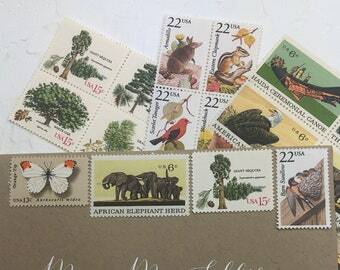 SHIPPING: If you need your beautiful vintage stamps by a specific date, please send us a message and we will try to accommodate your timeline. Add a handwritten note and a canvas gift bag to your order! These little gift bags are made from an eco-friendly material and are washable! 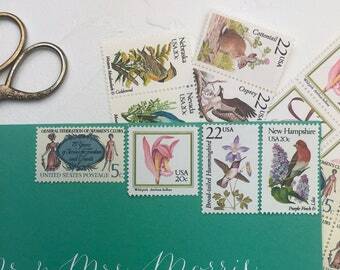 love the stamp collection! great value and fast delivery. Absolutely love these stamp sets. Perfect! I am happy to accept Paypal and credit cards via direct checkout. All completed orders will be shipped once full payment is received. Missing items: If there are mistakes or errors caused by me, I will be happy to correct them and will send the corrected version via USPS 2-day Priority Mail at no additional charge. Exchanges: If you are not completely satisfied with your stamps, please contact me to see if we can resolve the issue. I am happy to work out an exchange. Please contact me within 30 days of your receipt of your order to arrange an exchange. Buyer is to pay the return shipping fee and any new shipping fees to post your exchange to you. Returns: Vintage stamp returns are generally accepted. Please contact me and return your order within 14 days of the date of receipt. I will refund your funds, less the shipping costs. Please note that refunds or exchanges will not be offered on custom projects. The Little Postage House will ship to addresses affiliated with your Etsy Account unless otherwise specified by the client. Please send me a message if you need to have your order sent to a different address. The Little Postage house is not responsible for lost packages due to an incorrect address entry. Shipping & Handling: The Little Postage House ships all products via First Class Mail, unless otherwise specified. Please note that stamp orders typically ship within 1 week of the order date. If you're in a rush and need your stamps quickly, that it not a problem! Just send me a message and we can figure out the best way to get them to you! For shipping estimates on paper goods, please send me a message. Damages: The Little Postage House will not be held liable for any damages, losses, or any other hardship that occur once products are given to USPS. In the event of USPS-caused damages, please contact me so that we can work on a solution. I have thousands of postage stamps! I would love to create a custom order for you. Just send me a message and let me know what you have in mind! Once I receive your request, I will search for your stamps and send you pictures and pricing for your approval before posting the listing. Please note that there is a minimum of 35 postage sets for custom orders.